As soon as I saw the trailer for White House Down, I was like “Really? Olympus Has Fallen just came out and now you’re making another one?” Hollywood has gotten into making sequels constantly (which drives me insane but now is not the time to talk about that) and while this wasn’t supposed to be a sequel, it was supposed to be an entirely different movie, the trailer looked like the same movie, except this time the President was African-American. After watching it though, I can assure you that White House Down is not the poor man’s Olympus Has Fallen. The plot is technically the same, with terrorists causing havoc in the White House and trying to get the president, but early on viewers should recognize that this movie is not to be a realistic thriller. I’ll discuss those reasons in the spoiler’s edition. If you can’t change your stance on this movie mid-movie and try to enjoy it for what it is, you should just leave the theater because you should not expect Tatum to go Gerard Butler. This movie attempts to make a satire of the current presidential administration, specifically President Obama and Vice President Biden. This movie does not satire maliciously or demonstrate any political bias, but it highlights certain things that Obama and Biden do that are widely known and makes a mockery out of them. Once again, not maliciously, but just to have a good time. For example, the plot has President Sawyer (Jamie Foxx) trying to get a peace treaty together with the Middle East and has a speech in which he says “The pen is mightier than the sword”. Obviously this is up for debate, but I can picture President Obama saying something like that. President Obama also loves basketball. For half the movie, they have President Sawyer running around in a pair of Jordan’s. Coincidence? I think not. There are more examples but I don’t want to spoil the movie. There are plenty of entertaining one-liners in this that get you laughing and while you’re not rolling on the floor, you are getting more than a chuckle out of these jokes. Tatum and Foxx work well together in this and the chemistry seems legit so the audience is able to relate to the characters. The action scenes are entertaining but once again not 100% realistic so be wary of this. They’re fun to watch because half the time Tatum and Foxx are exchanging one-liners mid-firefight. The jokes allow the audience to disregard some of the unrealistic scenes and just take it for what it is, a comedy with bullets flying and walls exploding. My score for White House Down: 83. 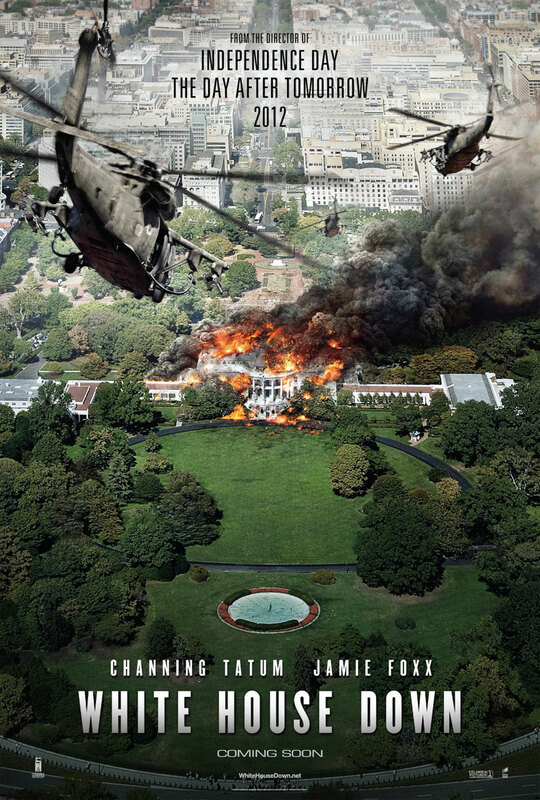 While Olympus Has Fallen is the better of the two, White House Down is still a crowd pleaser and one worth seeing. The comedic political satire did well with character development and the action scenes were well put together even if unrealistic. It’s one I’ll probably buy. My only major complaint was Maggie Gyllenhaal. She was boring, flat, and annoying throughout the whole movie. Seriously, if you want to make a really bad movie, put Maggie Gyllenhaal and John Cusack together in leading roles. You’ll be sure to win the Academy Award for Worst Picture. First off, a six man team manages to take out the whole entire White House security team while in lockdown in a matter of like six minutes. They just went around knocking on doors, saying “security check” and shooting guards as they opened the doors. No code word to get the guards to open the doors and no shots fired by any of the guards that I can remember. They took out the whole security team without a single shot fired against them. Wow! They got to the armory and armed themselves with machine guns mid-route and if I recall there was little to no security protecting all those guns and no keypad or safe to crack into. Granted, the main baddie is the head of the Secret Service, so they would have gotten the codes anyway, but at least if they had shown them putting codes into something it would have looked like the Secret Service wasn’t a ragtag team of rookie interns. The director jumped straight into the Tatum-Foxx show without ever showing how difficult it is to take over the White House. There is so much chaos going on in the White House during this movie and between that and the number of alliance switches and presidents being sworn in, I can see how some people might have had trouble following along at some points, even though I personally didn’t have that problem. Overall, a pretty good movie and good acting performances by all of the cast, except of course for Maggie Gyllenhaal.